VISIT MALAYSIA YEAR 2014 is a national multi-million ringgit campaign to woo foreign tourists from near and far to our exotic, culturally rich and beautiful shore. Tourism is one of the nation’s best industries.With several thousand visitors expected in Miri and also onward to Mulu this year, perhaps it’s time to ponder on Sarawak native cuisine, particularly in Miri. Magdalene Kong, a frequent west Malaysian visitor to Miri, is happy to note there are now more locally-operated eateries. “I normally come to Miri to enjoy food like midin cooked with belacan, a good fish like tapah braised in soy sauce and brown beans, seafood and perhaps some authentic native dishes. 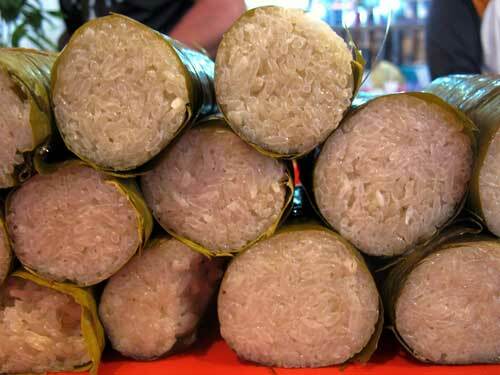 “I have eaten some fantastic food cooked in bamboo while visiting longhouses during my two Gawai trips. They were fabulous,” she said. She thoroughly enjoyed her back-packing journeys into the interior where she ate organic ferns and rare fruits. This satiated her thirst for knowledge “never before known to the outside world” – like unknown foods of the equatorial rainforest. She is particularly excited about glutinous rice cooked in pitcher plants which she even packed to take home when she last in Sirikin. Some travellers have blogged about their journeys in Sarawak and, indeed, exhorted the special delicacies of the jungle like rare mushrooms, fungi, honey and fish. Questions have arisen even among Sarawakians who have not tasted fish like empurau, semah, tapah or birds like wild Sarawak chicken or pheasants. In Sarawak, we use the terms native, indigenous and ethnic rather loosely. Native and indigenous would be closer in meaning. The two words refer to those originating from Sarawak. Ethnic would mean sub-tribe or sub-group based on culture, language and other anthropological identities. First, we need to identify some essential staple foods of Sarawak natives like the Ibans and Orang Ulus. These would be maize, upland rice, pumpkins and yams planted interdependently. Maize is grown almost at the same time as padi while pumpkins around the tilled rice and maize fields. Yams are also grown on the peripherals of padi farms. The natives fish in all the rivers and their tributaries. Semah, ikan keli, baong, empuarah, prawns, river turtles are what they can catch. The jungles yield mushrooms, fruits, meat from deer, wild boars and even bears. Birds can be shot with blowpipes. Guns are not often used because cartridges are beyond the means of many indigenous people. Originally, the natives were food foragers. Today, many exotic and even native wild fruits are still available. The more common ones are durians, dabai, langsat, rambai, engkili, buah ma, rambutans, isu, lutong, pinang, engkala, pedada, meram (asam paya), illipenut or engkabang and pulor. Many natives still enjoy going into the jungle during the holidays or fruiting season to forage for these fruits which are all part of their diet. There are many more rare and exotic wild fruits like the angled tampoi or the equatorial figs. The list is really long. When foraging for food – both fruits and meat – in the forests since moving to Ulu Limbang in the 1920’s, the late Jiram Pengiran (who lived up to 93) would look for empidan (now listed as an endangered species) and a certain type of tree ants among other wild vegetables and fruits. He caught three or four a few years ago and encouraged his grandson Sebastian Kudi to breed the jungle fowl. It was a successful effort. All Iban elders had also eaten different kinds of ants in the past. Today, deep fried ants are tourist fare in Cambodia and China. Punai is another small bird the natives of Sarawak catch with sticky nets, and eat after roasting them over a small charcoal fire. 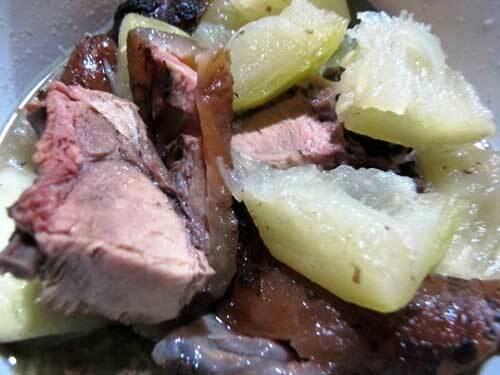 Boiled smoked wild boar meat cooked with organic labu (white gourd) and daun bungkang. Deep fried punai is often available as part of lelapan (halal) in Miri, costing RM6 each. A friend in Kanowit said one day he would like to export authentic Sarawak’s kFC (with a small k) which is Kanowit Fried Chicken. This chicken is punai which can be very destructive to a farmer’s rice harvest. Wild vegetables are found up the hills and down the valleys, and some even by the riverbanks picked out by ancestors of the natives. Palms like pantu, nipah, nibong, coconut and sago continue to be important umbut or upah or shoots the indigenous people retain as delicacies. Thus, from the land, sea and skies, they bring food to their tables – or mats if they are more accustomed to sitting and dining on their floor. In the world of food, Sarawak native cuisine has been relatively unknown. But lots of signature native cuisine such as pansuh and umai, appear more and more to the forefront – thanks to the Internet, promotions by the government, social organisations and others. Sarawak native food, according to Robert Entalai, is simple in technique. “My people use mostly fresh ingredients from the lush jungle or their small farms. The use of indigenous domesticated and wild food ingredients can represent Sarawak native food and cuisine. “I remember how my mother would cook a wild vegetable sweetened by the flowers of pumpkins or a few leaves from shrubs which, when cooked together with wild mushrooms, became soft and tender and of course delicious,” he said. “Our native cuisine differs somewhat from Malay or Thai cuisine in its simplicity and directness of flavor. The use of wild ginger, daun bungkang and jungle leaves can bring subtle flavours to various dishes. Caleena Pasang of the Canopy Café, Miri, and her colleagues prepare nuba laya or soft rice wrapped in daun long. According to her, this much sought after soft rice, goes well with bamboo shoots cooked with local pork, and wild vegetables. Both the indigenous and non-indigenous customers of the Café come as early as 11 o’clock in the morning to enjoy more than eight indigenous dishes offered. Canopy Café opens six days a week (except Sundays) and serves only breakfast and lunch. The Summit Café is another indigenous outlet serving food for the lunch crowd. The tables are usually snapped up by noon. The crowd would not cease coming until 2 pm. Food is served economy-fast-food style and the queue can be long. However, that’s the best way to ensure you can get your choice dishes of stir fried ferns, boiled salted fish with lemon grass, boiled salted belly pork, oil palm shoot boiled with chicken and tapioca leaves cooked with torch ginger. A few Chinese open market stalls employing Iban and other native cooks, also offer a few dishes from their kampung repertoire. At the Miri Central Open Market, one stall proves very popular with customers. The cook is an Iban from Ulu Bintulu. Most customers come for two special dishes – pig’s stomach cooked with pineapple and pig’s blood with kuchai or chives and lots of onions. The MJ BBQ stall next to the Mederka Mall also proves ever popular with the dinner crowd. The best seller is the Iban-style BBQ meat divided into three categories – organ meat like stomach, lean pork and belly pork. 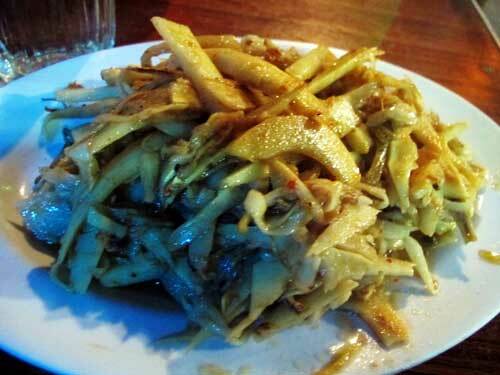 There are also vegetables like wild mushrooms, fungi and organic bamboo shoots, wild ferns and home-grown veges. One of the best things about eating at MJ BBQ is the almost instant service. Within five minutes, customers are served with the first bbq meat dish. 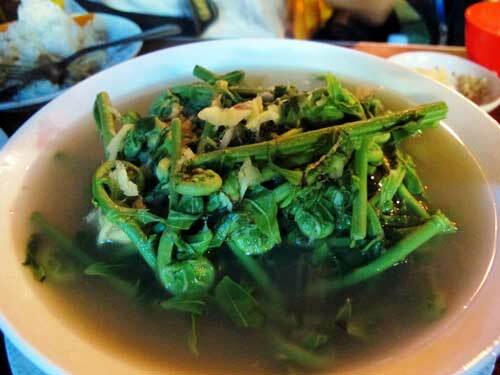 One of the best indigenous soups is the hairy fern soup cooked with ikan bilis and lots of ginger. It’s probably the tastiest and freshest organic soup one can get on Borneo Island. In Iban, it’s called sup paku kubok. Alice Daring, a beader from the Miri Heritage Centre, said: “A cook book featuring some of the renowned indigenous dishes would really be helpful. “It would encourage the new generation of Sarawakians to venture further outside their own culture. I know many ingredients may not be readily available in town but some adjustments can be made to bring out our old styled tastes and flavours. Kim, a college lecturer, added: “Due to the new development and modern changing environment, some of the old traditional foods along with an age-old technique is also almost forgotten. “What my grandmother used to cook in the kampung tasted wonderful. Our rice seemed sweeter 20 years ago. Even the fish cooked in bamboo in those days seemed better. “Today, we have to use ikan keli or pond-reared fish for our pansuh or bamboo cooking. She hopes sustainable farming in Sarawak will bring back the deer, bats, wild pigs, wild fish and even the tasty jungle vegetables. This will help support the growing population with a better and healthier diet. She is, now, saddened many rural people are suffering from diabetes, joint pains and other modern ailments ever since the introduction of sugar, artificial flavouring, and even cooking oil. She remembers her healthy elders and their “natural” diet which was almost oil-less. Deep fat frying was not part of the longhouse food preparation many years ago. May be this could be what universities in Malaysia should be researching about! Desserts like lumpi, bubur kapu (an Iban rice flour chendol), penyaram, kuih jala, and others have already been served during food festivals throughout Malaysia. The quality and style of presentations have been improved over the years to a very high standard. These desserts from the ulu are very tasty and memorable and slowly appearing at several eateries in Miri. Hopefully, more Sarawakians will start documenting the ethnic recipes to make Sarawak indigenous food better known. Indigenous herbs, jungle edible shrubs, flowers and roots can really be re-introduced to the world. Such books can help give Malaysians and the world a better understanding of Sarawak natives – gastronomically speaking.